We stumbled into Little India enclave during the weekend searching for banana leave rice. There used to be one very authentic place but I had forgotten the name of the restaurant. It has moved elsewhere. So, we headed to Meena cafe. You know it is very much an Indian restaurant when you see the whole family helping out. 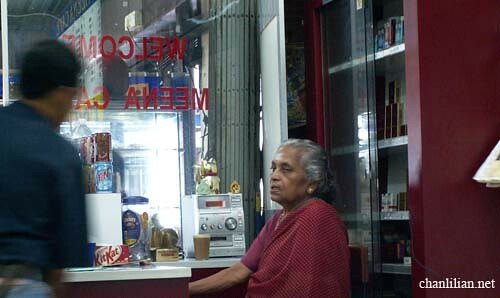 Like this granny sitting at the cashier looking very stern. 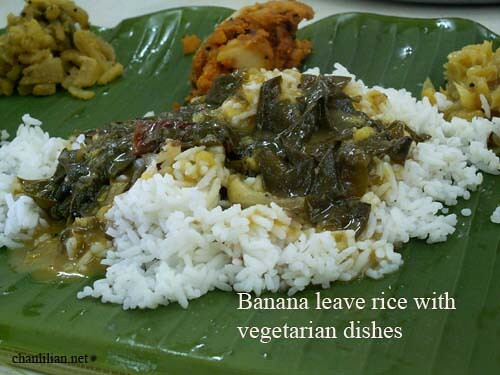 To those who do not know what is banana leave rice, it simply means that banana leaves replace plates as the serving medium. Usually, at Indian weddings, they will have these long tables. Then, they will place a clean banana leaves on each place and serve the rice on it. Eco friendly, no? I opted for a vegetarian version as they have sold out their mutton curries. BTW, Indians who are Hindu do not take beef. So, I chose vegetarian food rather than boring ole fish or chicken. Like the photo above, it is all vegetables. They have some potatoes, tofu, cabbage, radish and spinach. The funny thing about eating banana leave rice is you can really eat a lot. The above does not look very appetitising but tasted great. I finished off something like 2 servings of rice (I mean my usual quantity of rice X2). My son ordered poori which is two puffed-up pratha-type of bread served with more potatoes. The mango lassi is smooth and yummy. A nice complement to the spicy food. And this is the paper thosai which is like 3 feet in length. My hands were dirty at that time (from eating banana leave rice with my fingers) so I wasn’t able to take the photo myself. Otherwise, I could use a better angle to project how long the paper thosai is. 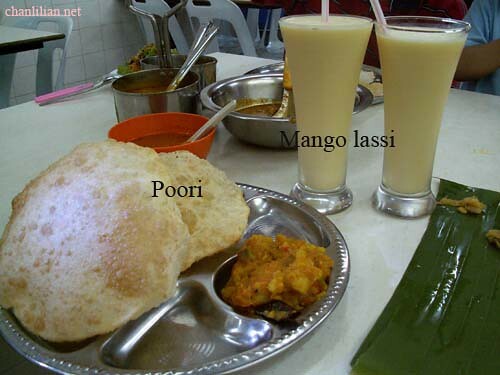 Thosai is usually served with at least 4 types of curries which include one sambal coconut. All the above food costs only about RM3-RM4 per servings. A nice experience indeed.